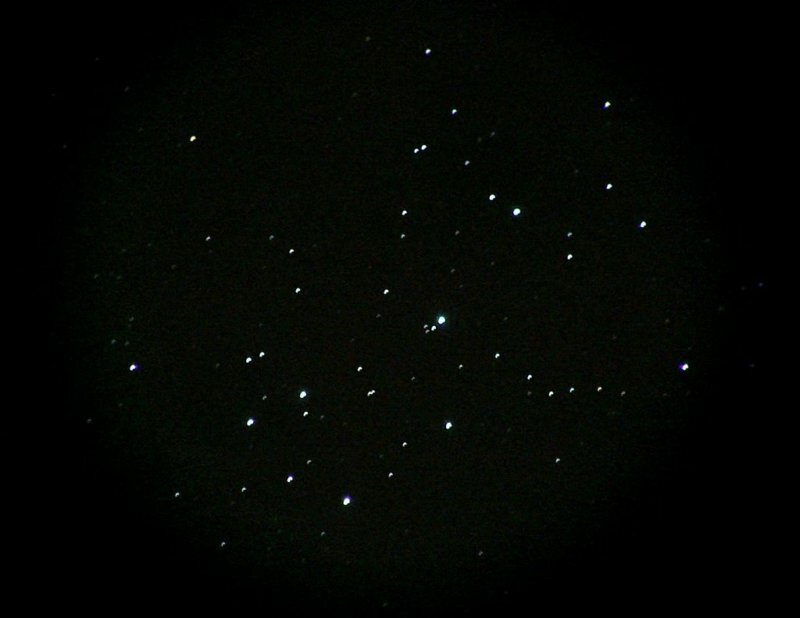 Here is another image of the Pleiades. Much better than the picture above. Note that this image is mirrored vertically compared to the image above because it is taken through the eyepiece, while the image above was taken directly with the lens of the Fuji Finepix 4700 camera. I purchased a digital camera adapter that clamps on an eyepiece and allows attachment of the camera for afocal projection. I used the Meade ETX-80 telescope and kindly asked the GOTO to move to the Pleiades. I took this image through a Meade Super Plössl 26mm eyepiece (nice big lens) with the Panasonic DMC-TZ1 camera (f/2.8, 5mm = 35mm equivalent on 35mm camera, 15s exposure time, ISO-80). The stars are not perfectly pinpoint because the Meade ETX-80 has an alt-azimuth forke mount and not an equatorial mount. Taken on 03-29-2010.